Flags make great tattoos. Some more so than others. They are icons of nationality, ideology and symbolism. They represent culture, ideas and identify something that people are willing to live and die for. They can be combined with other icons of a culture to create a powerful image of the wearer's manifesto. 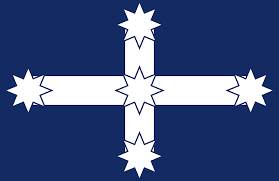 In Australia, perhaps none more so than the Southern Cross, particularly as it appears on the Eureka Stockade flag. Many tattoos abound with either the Eureka Flag or a combination of that flag and the other icon of Australia's rebel spirit, the infamous outlaw Ned Kelly (who is believed to have been born in December 1854 during the Eureka Stockade(1)). Both Kelly and the Eureka Stockade represent a fierce, fighting spirit against tyranny and corruption while defending justice and compassion. Some see Kelly as nothing more than a thief and murderer. However, to many others he is a hero who fought against the corrupt land acquisition and injustices of the government. Local aborigines see Captain Cook as representative of the 'theft of their land, the exploitation of their labour and the denial of their cultures', while they consider Ned Kelly as being 'concerned with freedom, dignity and true justice'(2). Kelly himself, claimed to be acting against police corruption and seeking justice for the poor. He called on anyone who has cause to fear him to give '£10 out of every hundred towards the widow and orphan fund'(3). 'We swear by the Southern Cross to stand truly by each other and fight to defend our rights and liberties'. 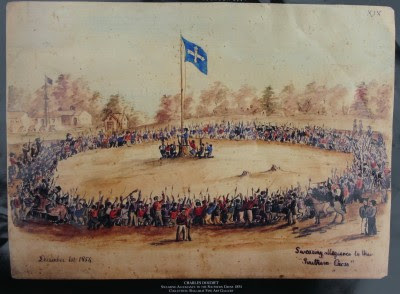 Swearing allegiance to the Southern Cross 1854. 'According to Frank Cayley′s book Flag of Stars, the flag′s five stars represent the Southern Cross and the white cross joining the stars represents unity in defiance. The blue background is believed to represent the blue shirts worn by many of the diggers, rather than represent the sky as is commonly thought'(4). 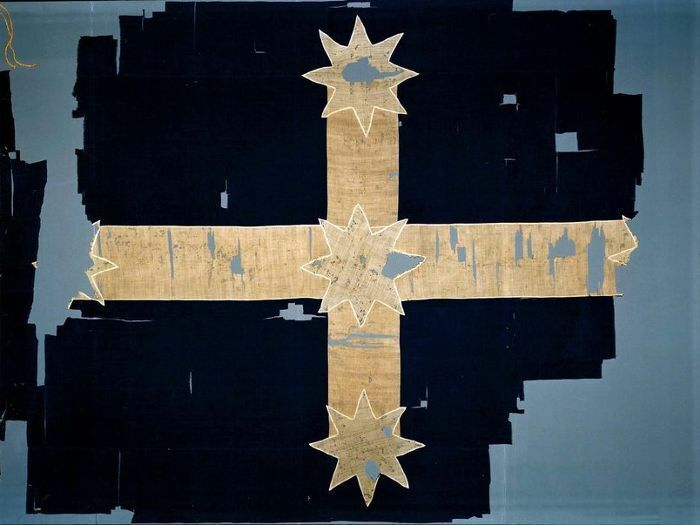 Over the years, the Eureka Stockade flag has been adopted by numerous groups, including unions, outlaw biker gangs and various protest groups. During the administration of Queensland Premier Campbell Newman, harsh laws were passed to crack down on motorcycle gangs, which included identifying members and their associates through certain imagery; the Eureka flag was one of those images. Newman also cracked down on the other Eureka flag flying group, the unions, by passing laws that targeted their members and placed restrictions on how they engaged politically. 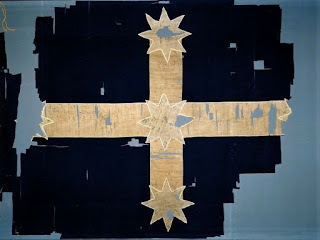 If there was ever a time where unity in defiance against injustice was important, it was during this time; a time when the oath of the Eureka flag was ever so appropriate. 'Irrespective of nationality, religion and colour, I call on you to salute the 'Southern Cross' as the refuge of all the oppressed from all countries on earth'(5). The spirit of Eureka and Ned Kelly was a fight against oppression and injustice. The Southern Cross represents refuge for people from all over the globe who are fleeing oppression. It is the flag of the asylum seeker, the refugee. Yet nationalists and white supremacists proudly sport the Southern Cross through their tattoos or paraphernalia as a symbol of Australian culture without realising that the very culture they claim to be defending is one of multiculturalism. Modern Australia was built from the blood, sweat and tears of aborigines as well as immigrants from many foreign ethnicities and religions. Flying the Southern Cross is to acknowledge and respect Australia's indigenous people and to welcome and honour migrants and refugees. The arrival of British settlers in 1788 brought a spirit of racism which saw the indigenous inhabitants displaced or murdered and their lands stolen. The Australian flag can therefore be described as a dichotomy in which the brutal racism of the British colonisers is represented by the Union Jack while the fight against government corruption and persecution is represented by the Southern Cross. To use the Southern Cross as a symbol of bigotry to oppress and abuse the persecuted is to completely dishonour its origins in the fight against oppression and injustice. 1. Lewis, Ian. 'Ned Kelly: A Short Life', Notes - 1. Son of Red, location 7378, Kindle version. Hatchette Australia, ISBN - 978-0734405449, 2008. 3. National Museum Australia, 'Jerilderie letter transcription', Page 39, http://www.nma.gov.au/collections/collection_interactives/jerilderie_letter/page_1 (HTML version). 4. Ausflag, 'Eureka flag', http://www.ausflag.com.au/eureka.asp, accessed 28 December 2015. 5. Carboni, Raffaelo. 'The Eureka Stockade', chapter XXIX, location 642, Kindle version. Amazon Digital Services, Inc, ASIN B004TP1N5I, 24 March 2011. (Digital version of original book published in 1855.